Mama Manifesto: PLANES, TRAINS, and AUTOMOBILES! It's time to have a little re-creation on vacation. Our family of five (children aged 4,6, and 8) is heading to Michigan and we will spend a considerable amount of time just getting there (are we THERE yet?) T0 pass the time, we have loaded up a hefty amount of diversions for the dear ones: educational coloring books, mini-travel games, healthy trail mix, fruit leather, little stuffed animals, an American Girl doll each. We plan on rotating each child through short reading times of their favorite stories and then all taking a nap for 45 minutes mid-flight. However, if the snacks are consumed before we get to the airport, if the crayons happen to roll under the seat in front of them, if none of my kids can agree on who gets to be read to first, if my son continues to accidentally kick the seat in front of him, or if we lose the dice from our mini-travel game.... we have downloaded Air Buddies, Snow Buddies, Fire House Dog, What A Girl Wants, and Alvin and the Chipmunks on various phones, ipods, and our laptop. Everyone has their own set of headphones. What 5 tricks do you have up your traveling sleeves? I feel nauseous just thinking about flying with my kids. They are great kids, but there is something about being locked into a confined space with two children who could melt down at any time and there would be no escape route, no "naughty step" or crib for a time out. The tricks that we have developed are to hand the flight attendant a goodie bag of treats when you get to your seats and see who your flight attendant is. They will take such good care of you and be extra kind , even if your kid turns into the chair kicking, loud crying child from the abyss. I have had flight attendants move us to better rows, offer free headphones, offer extra snacks and also offer to warm up bottles and sippy cups for me and i credit it totally to the treats. I also like to pack the gallon sized ziplock bags with activities and rotate them along the flight: little notebooks (fit on the tray so well) and pages of stickers are great, along with crayons and markers & a cup to hold them so they do not go sliding off the trays, play dough is fabulous on the trays as well, and I have played "eye spy" until I feel ready to gouge out my own eyes and forfeit my sight just so that I no longer can spy to play Eye Spy. We also bring a medium sized stuffed animal on the plane that doubles as a super cozy pillow. I pack a ton of snacks, and then I pack even more. I try to aim for lower sugar snacks so that my kids do not get super hyper, but I also save a lollipop just in case one of them melts and cannot recover...I am not above bribing with sugar if they are screaming their heads off on a plane. I have a friend who has twins and she brings goody bags for all the passengers within the couple of rows around them (in the goody bags are ear plugs, and other true treats). I think that is an amazing idea. She also offers to pay for all of their headphones for the movie. Oh, and a change of clothes for sure for my kids! Someone always gets airsick, or has a diaper blowout, or spills their juice all over themselves, etc. A change of clothes can quickly save the day!! 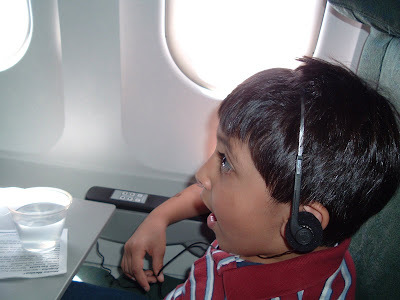 I spent many a flight stressed and anxious and monitoring every passenger seated nearby, in a panic that my child might make a peep and annoy someone. You can guess how that turns out: toddler senses stress, toddler reacts, toddler acts like a total nightmare. I have learned the hard way to try to RELAX. I do the best I can with movies, distractions, and discipline, but the bottom line is, sometimes even with our best efforts, our kids might be the screamer/kicker/seat jumper on the plane. Stressing about it won't help. I come prepared, but I also lower my expectations, and try to be okay with people rolling their eyes when I sit in their row, or casting annoyed glances at my kids. Because you know what? I wouldn't want to sit by a bunch of kids either!! :) But I'm not about to stop travelling, so I've gotta just roll with it and be okay with being the least popular gal on the premesis for a few hours. Thanks so much for these great tips. As we prepare for our annual pilgrimage from CA to NY, I will definitely employ your ideas! Last time we traveled with Grace, she was an infant...this year is a little different as she is a curious and busy 19 month old. My mother-in-law recently suggested her strategy for traveling cross country with two small children. She suggested that Jeff and I board the plane and drink lots of martinis and let Grace run free. The fact that she actually did this several times when her boys were young explains A LOT about my husband. (he, he) Thanks for the ideas!